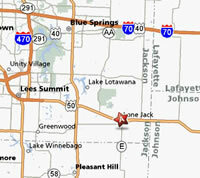 Lone Jack nails many a speeder on their way to Sedalia or the Lake of the Ozarks. Fortunately, they are amenable to amending speeding tickets to a non-moving violation. The Prosecutor is firm but fair. A defective equipment will cost you between $175.00 and $250.00. My charge for Lone Jack is $200 per ticket. We accept checks, credit cards and cash. All money for fines and my fee must be paid up front. For more information on how the process works, visit the About Us page. Court is scheduled in Lone Jack on Tuesdays. You may not have to appear depending on your ticket. According to the 2000 Census, Lone Jack has a population of 564 people. 22% of Lone Jack residents report German ancestry, and 20% report Irish. It is the site of a historic Civil War battle. On August 16th, 1862, the Civil War, with all its fury, descended on the people of Lone Jack. It was here that the bloodiest battle fought on Missouri soil took place. But for a twist of fate, it would not have happened at all. In the aftermath, thirteen homes and businesses lay in ashes and over 200 men lay dead, dying, or wounded. The citizens of Lone Jack were not without their own sorrow for some of those who died were boys from their community for the Southern recruiters had been in the area in the days prior to the battle.